All About Reading GIVEAWAY – New Color Edition! I have an amazing giveaway for you today! As you may know, we absolutely love the All About Reading curriculum from All About Learning Press and they recently released their new color edition which is stunning!! 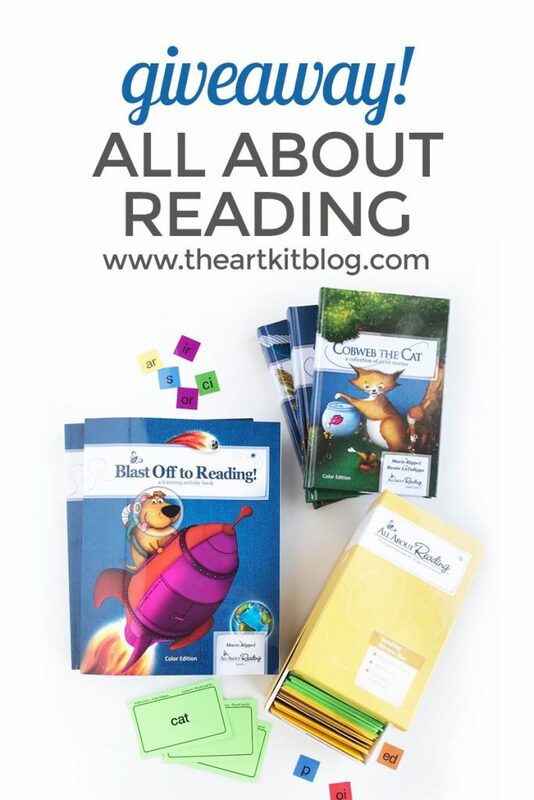 If you haven’t seen our full review of All About Reading, definitely check it out here. You can also head directly to All About Learning to learn more about their program. If you aren’t familiar with All About Reading, they present the concepts in such a way that it is not only easy for the students to understand but it is also easy and fun for the instructor to teach – a winning combination if you ask me! Okay, now that we’ve gotten you excited about this truly amazing curriculum, it’s time to share all the details on the giveaway! One lucky winner will receive their very own All About Reading level of their choice + an interactive kit if they don’t already have one. Fine print: All About Learning may elect to award an alternate prize of equal value if the winner resides outside the United States. The giveaway has ended! Sarah R. is the winner. Congrats to Sarah and thank you to everyone who entered. Check back again for more great giveaways! Please enter to win below. I haven’t used this program yet but have been considering it. Now that it’s in color, I want to get it even more! I have not used it before but am looking into it for my daughter and son who are struggling a bit and need more help!! I haven’t used All about reading before but heard great things about it from my friends. I would love to win this giveaway for my son who is struggling in learning reading. No I have not used this, but I love what it has to offer one. I have one child almost done with AAR 1 and the other with AAS 2 🙂 Love it! No, I haven’t. I will take a look. I used All About Reading when my 13 year old was learning to read. Now I’m looking into it for my 5 year old to use. I haven’t used this program before, but it looks fabulous. I think it could do great things for my youngest who is really struggling with reading. I haven’t used it before but I would like to try it with my granddaughters. No, I have never used All About Reading before. I have not used it yet. But I have friends that have recommended it. Such a great giveaway! I have not ever used All about Reading, but would love to add it to my homeschool curriculum! I’ve never used it before, but it looks like a fun program to learn with. My kiddos would enjoy some fun and engaging ways to learn to read! I’m currently using the pre-reader curriculum and I really like it! It’s much nicer than anything else I used with my older kids. I love AAR! My child is halfway through level 1, and I look forward to starting level 2 soon. We are working on level 2 right now but excited to see it is now in color! I would just love to give this a try with my daughter; I really think it’d be fun for the both of us. We just completed level 1 with my son. This is my first time teaching anyone to learn how to read and I love how simple this program made it. The stories are engaging, he looks forward to reading! So many readers we had picked up at the library or Bob books just didn’t hold his attention or required him to read words without actually teaching concepts. This program blew me away and I am so excited to be able to continue teaching my children and now in color! I have one level but need another for my oldest son. I love that its now in color! Love this curriculum! Can’t wait to start using it for my own kids. We are using the black and white version of AAR1. Looking forward to someday having the new version! I have used Levels 1 and 2 with my 3 kids and will need Level 3 in two weeks! Have used level 1 and 2 and would love to win level 3 for my daughter! all about reading is the best! I have never used AAR before but I will be starting my homeschooling journey very soon and would LOVE to give it a go especially because I’ve heard such great things about it. Yes, I am using level one with my youngest son. And I have used all about spelling with three of my older sons. Love AAR and AAS. We’ve used 1 and 2, and are nearly through level 3. We would love to get the color version for 4! I can’t wait to start level one next year, we are doing pre reading level now I’ve been impressed how well my son is learning and can’t wait to continue. Do you use all about spelling too? And is that enough for an LA problem? I’ve never used AAR before, but I think it would be perfect for my hands-on daughter when she starts kindergarten this year! I haven’t used AAR before but I am intrigued by it with my 4th grade child. There seem to be several gaps in his reading. I haven’t used All About Reading before, but my children are starting to read so this would be good.